Trim the ends of okra. 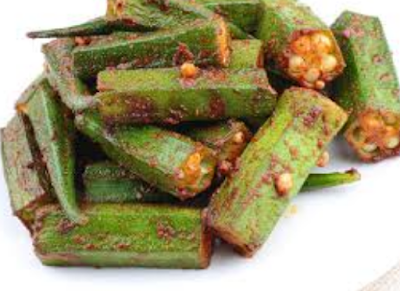 Heat oil in sauce pan and quickly fry okra for 3-4 minutes. Strain and keep aside. In a juicer blender combine yougrt, tomato, fried onion and all the spices. Blend to a smooth paste. In a same using leftover oil, cook the yougrt mixture till it thickens, but still have some moisture left. To this add fried okra. Cover with a lid and put it on a dum for 8-10 minutes.